On March 28, the Department of Resources and Development held a consultation meeting with various National Government departments and offices in preparation for the upcoming Investment Facilitation Symposium in the FSM. The meeting took place at R&D conference room from 9:00am to 12:00pm. Represented at the meeting were the Department of Resources and Development, Department of Justice, Department of Education, Department of Finance and Administration through the Office of Customs and Tax Administration, the Office of Registrar of Corporations, the Office of Environment and Emergency Management, and the Public Information Office. It was agreed that a second round of consultations national offices will be held after the symposium organizers have completed other similar meetings with stakeholders at the State Governments by mid-April. In observance of the Holy Week, the National Government employees are granted administrative leave on Friday, March 29, 2013 according to a March 27 Presidential Memorandum. Moreover, March 31 has been established as Micronesian Culture and Tradition Day pursuant to FSM Public Law No. 16-27. This legal holiday will be observed on Monday, April 1-- per the same memo. As is the case during administrative leave and holiday, "essential services" for the government will carry on with affected employees subject to compensation as prescribed under the National Public Service System Act and relevant provisions of the FSM Code. FSMIS (March 27, 2013): The first Migrant Resource Center (MRC) in the entire Pacific region was dedicated on the 26th of March at its Kolonia location in Pohnpei as a joint effort between the Federated States of Micronesia, the Pohnpei State Government and the International Organization for Migration (IOM). In his remarks, Vice President Alik Alik thanked the IOM for its efforts in the FSM since establishing formal presence in 2008. He also acknowledged the dedicated staff at the IOM Office in Pohnpei under the lead of Mr. Ashley Carl who played vital roles in the vision to avail the MRC. “With the opening of the MRC, we embark on yet another chapter on the FSM-IOM partnership. We accomplish another milestone in our relations that both FSM and IOM can be proud of”, Vice President Alik said. Signifying the value of the center to the IOM, Mr. Andrew Bruce, Bangkok-based IOM Regional Director for Asia and the Pacific came to Pohnpei for the ceremony, giving himself the opportunity to interact with the FSM-based IOM staff. In his remarks, he explained that an allocation of $100,000 was provided under the IOM Development Fund for the establishment of the center, specifically to “advise citizens of the FSM who wish to migrate how they can do so safely”. According to Mr. Bruce, “upon becoming a member state, FSM became eligible to the technical assistance and migration management under the IOM Development fund – a fund set up specifically to assist members with economies in transition to address particular migration management challenges”. “The center will provide a number of core services to potential migrants, including pre-departure orientation training, awareness raising on the risks of human trafficking, referral to existing support services in their country of destination, and general information dissemination”, Mr. Bruce highlighted, setting clear views on how the center would assist the various migration experiences the FSM citizens now encounter. The IOM Regional Director also pointed out how the center is envisioned to facilitate integration for Micronesians who wish to reside in the United States; return from the US to their island of origin; and move from the FSM to United States and possibly to other countries such as Japan and Australia, particularly for education purposes. He also envisioned that the center could be utilized by migrants living in the FSM sometime in the future. The US Embassy Deputy Chief of Mission, Mr. Miguel Ordonez commented on the strong FSM-US relations reaching back to the Trust Territory era and stressed the need for collaboration to ensure the success of the center. “We look forward to working very closely, I know the IOM office is right next to the US Embassy, so we’re very close. We hope to collaborate and we are glad to provide any assistance we can now and in the future”, Mr. Ordonez remarked. The opening ceremony brought together a flock of high level attendants including the Governor of Pohnpei State, Mr. John Ehsa, Lt. Governor Marcello Petersen, Ambassador Eiichi Suzuki, Japan Embassy, Ambassador Martin Quinn of Australia, Cabinet members from that National and State governments as well as a number of civil society organization representatives. The FSM joined 148 other member states of the IOM on December 2011, which includes the Pacific nations of Vanuatu and Nauru. FSMIS (March 27, 2013): The FSS Micronesia undertook a multi-tasked trip between Pohnpei and Chuuk on February 25th to March 8th with the Secretary of Justice on board, later joined by US Ambassador Doria Rosen and Postmaster General Ginger P. Mida on the way back to Pohnpei. On the way to assist in the FSM National Election in Chuuk on March 5th, election boxes were delivered to Sapwuafik, Nukuoro, and Kapingamarangi – three outer islands of Pohnpei. While on Nukoro and Kapingamarangi, Secretary Skilling met with the Mayor of Nukuoro and the Chief Representative of Kapingamarangi. At different locations over a period of five days and nights, the FSS Micronesia crew conducted nine boardings on foreign fishing vessels encountered on the way, resulting in $51,000 in fines and citations, and ensuring compliance with fishery regulations. While in Chuuk, six of the crew members were deployed to six islands in the Chuuk Lagoon to assist in providing security at various election sites on March 5th. In addition, election results from the outer islands of Chuuk were obtained through the radio telephone system on the FSS Micronesia. Secretary Skilling also took the time to accompany US Ambassador Doria Rosen who went to Fefen Island on March 5th to observe the conduct of the national election process. 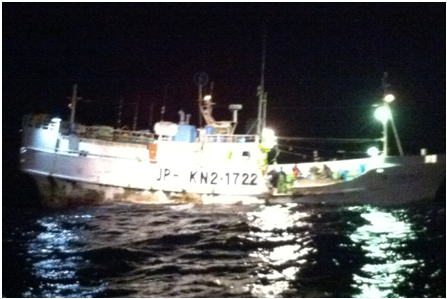 The observers did not discover any irregular incidents. Ambassador Rosen and Postmaster General Ginger P. Mida had the opportunity to witness first-hand the maritime surveillance of FSM waters. Mrs. Mida and the Maritime Wing are assessing feasible ways for the FSM Post office to be able to utilize similar trips among the remote islands in the FSM, especially for urgent delivery requiring safeguards of commodities and supplies. According to Secretary Skilling, “the trip was a success in its entirety”. For more information, contact the FSM Department of Justice at 320-2644 or write to fsmpio@mail.fm. FSMIS (March 27, 2013): The FSM is heightening preparations towards the staging of an Investment Symposium to be held from May 6-9 as part of a series of federation-wide undertakings to better all-around business climate as a pivotal component in facilitating sustainable development and economic growth. In his March 15 memo to departments and office at the national government, President Manny Mori said the symposium would result in the formulation of actions and measures to “facilitate investment in the FSM, focusing on improving the business climate, enhancing financial capacity of targeted private sector stakeholders as well as the confidence of financial institutions to lend to the private sector”. A committee has been put together to undertake state and national consultations and steer the comprehensive preparations with membership from the Department of Resources and Development, the Office of SBOC, the FSM Development Bank, and the FSM Petroleum Corporation. April 12-16, consultation meetings in the State of Kosrae. Meetings with Pohnpei State has already been done according the department. The Department of R&D serves the focal point for the symposium which will be held at the College of Micronesia-FSM, Palikir Campus. President Mori also indicated that a State and National Leadership Conference will immediately follow the symposium to allow for leadership consideration for endorsement of its recommendations. For further information, contact the Department of R&D at 320-2646 or write to fsmpio@mail.fm. FSMIS (March 25, 2013): The FSM National Olympic Committee (FSMNOC) held its annual general meeting on March 19 at the FSMNOC Training Facility in Nett, Pohnpei – a few feet away from the Pohnpei Botanical Gardens. The general meeting is held once a year, bringing together the officers of the national sport federations, the four state representatives on the FSMNOC and other sport and community leaders to review the past year’s activities, finance and budget matters, FSMNOC operations and projects and assist in planning for future undertakings. The meeting started with the blessing of the new FSMNOC Office Complex by Rev. Norbert Kalau. The complex includes a 6-lane 25-meter competition swimming pool and a two-story office building. In July, 2012 the FSMNOC and Pohnpei State signed a 50 year lease agreement after years of negotiations, opening the way for the $150,000 worth renovation works on existing facilities funded by the Olympic Solidarity Olympoceania Grant, bringing vigor into the location that has become the operation site for the FSMNOC and the community swimming program that utilizes the renovated pool. Several matters were discussed at the meeting with some reports by Mr. Jim Tobin, FSMNOC Secretary General, relating to FSM’s participation at the London 2012 Olympic Games, plans for the September 2013 Pacific Mini Games in Wallis and Futuna, status of the July 2014 Micronesian Games (MG) in Pohnpei and some discussions on why the FSM Games failed to take place this coming summer time. The full day meeting also covered the January – December 2012 income/expense report by the NOC staff which showed a total of $709,217.00 from various grants and how each grant was expended within the one-year period. This amount also included a subsidy of $30,000 from the FSM Government. As part of the meeting, the FSMNOC also organized other seminars from the afternoon of 19 to 22 relating to the organization of sport competition and administration of big games such as the Micronesian Games. At these seminars, Mr. Bill Kildermans, Chairman of the Micronesian Games Council, Mrs. Baklai T Chilton and Ms. Lulu Rivera from the Palau National Olympic Committee (PNOC) were instrumental in sharing Palau’s experiences in the organization of the 2010 Micronesian Games in Koror to help Pohnpei State gear up for their turn of hosting the Micronesian Games once more. Pohnpei State first hosted the MG in 2002. Mrs. Chilton is also the Minister of Community and Cultural Affairs in the newly started Tommy Remengesau Jr. administration in Palau. The seminars were attended by Lt. Governor Marcello Petersen of Pohnpei State and various members of the 2014 Micronesian Games Organizing Committee. The various FSM sport federations, such as the FSM Athletics Association, FSM Wrestling Federation, FSM Weightlifting Federation, FSM Basketball Federation, FSM Football (soccer) Federation, etc. also took the opportunity to hold federation meetings as some members from Kosrae, Chuuk and Yap were already in town per FSMNOC matters. FSMNOC meeting participants included Manuel Minginfel, 4-time weightlifting Olympian and gold medalist in all of Oceania and the Pacific region, and Larry Uwelar, medalist in regional wrestling competitions, both from Yap. The position of FSMNOC Vice President from Chuuk has not been filled since left vacant after the passing of one of FSM’s greatest athletes ever, Mr. Keitani Graham, who passed away on December 7 at his home State of Chuuk. For more information, please write to fsmnoc@mail.fm or call the FSMNOC at 320-8914. FSMIS (March 22, 2013): President Manny Mori recently departed the FSM Capital on a trip to the Kingdom of Tonga where Pacific Leaders gathered on March 21-22 for a summit on energy sector development roadmap throughout the region. Leaders will also gather for the same purpose in Auckland, New Zealand on 25-27 of the same month. President Mori will include in his summit remarks some briefings on concurrent energy development projects for outer-island electrification and hydro plant restoration in Pohnpei sourced by European Union EDF grants of nearly $15 million over a 10-year period; Japan International Cooperation Agency (JICA) 180 kilo-watt-hour solar energy pilot project located at the College of Micronesia-FSM, Palikir and the FSM President’s Office; Pacific Environmental Community fund of $4 million from the Government of Japan as well as an Italian $800k grant for photovoltic grid-connection system in Chuuk. The President will have the opportunity to highlight the FSM’s Energy Policy, which got adopted in October 2012, providing the energy development planning and execution guidance for the foreseeable future. The Energy Policy’s main objective is to improve the quality of lives “through the provision of safe, secured, and affordable energy”, with the aim that 30% of total energy production will be achieved through renewable energy sources by 2023. The FSM delegation to the energy summit accompanying President Mori includes Mr. Hubert Yamada, Assistant Secretary Energy Division, Department of Resources and Development; Mr. Mark Wiate, General Manager, Chuuk Public Utility Corporation; Mr. William Hawley, Board Chairman, FSM Petroleum Corporation and Mr. Jared Morris, Chief Executive Officer, FSM Petroleum Corporation. For more information, write to fsmpio@mail.fm or call 320-2548. FSMIS (March 19, 2013): With assistance from the United Nations Environmental Programme, the FSM Office of Environment and Emergency Management (OEEM), in collaboration with the Division of Customs and Tax, FSM Department of Finance and Administration, is organizing a 3-day workshop on Controlled Ozone Depleting Substance (ODS) to be held from April 22 to 24, 2013. The objectives of the training are to: a) Increase awareness of controlled ozone depleting substances; b) Enforce FSM current ODS Regulations; c) Provide an overview on newly established licensing and quota system for ODS; d) Provide an overview of Customs regulations, monitoring and control systems for ODS in other countries in the region; e) Provide opportunity for customs and law enforcement officials to detect and identify different types of refrigerant using tools and equipment provided by United Nations Environment Programme. The training will bring together officers in the areas of customs, law enforcement and border control from state and national governments at the OEEM facilities in Palikir. On September 19, 2012, at the occasion of the 25 anniversary of the Montreal Protocol and the signing of the FSM Regulation for specific implementations of the protocol, President Mori highlighted FSM’s role in the global effort of phasing out ozone depleting chemicals to ensure a habitable home for future generations of Micronesians. The upcoming training is part of strengthening capacity building for key officials with direct impacts on ways to fulfill responsibilities under the Regulations and the Montreal Protocol. A lab technician takes blood for a rapid HIV test, Yap State Hospital Laboratory, Federated States of Micronesia. This month Ministry of Health representatives and stakeholders from across the region will come together to determine the future direction of the response to HIV and other sexually transmitted infections (STIs) in the Pacific. ‘With the conclusion of the Pacific Regional Strategy on HIV and STIs this year, now is an opportune time to take stock of the progress made and decide how best to sustain achievements while identifying priority areas for continued donor support,’ said Dr Dennie Iniakwala, HIV and STI Team Leader at SPC. ‘Here in the Pacific, we have some of the highest STI prevalence rates in the world. Our people are therefore at greater risk of contracting HIV. We must not become complacent. We must endeavour to sustain and build on the progress made to date,’ said Dr Iniakwala. To date, over AUD $53 million has been delivered to the region for HIV and STI programming through the Pacific HIV and STI Response Fund and The Global Fund to Fight AIDS, Tuberculosis and Malaria. This investment has led to improvements in the ability of Pacific Island countries and territories (PICTs) to address HIV and other STIs. The introduction of rapid HIV confirmatory testing, for example, has greatly improved the turnaround time for HIV results, from 6 weeks to one day in many PICTs, and this has increased the number of people coming for HIV testing. ‘These are important achievements. By increasing HIV test accessibility and testing the right population groups in our communities, we are better able to prevent and control HIV in our region,’ explained Tebuka Toatu, HIV and STI Laboratory Specialist at SPC. ‘Previously, many laboratories had to send samples overseas for confirmation of HIV test results. However, with the introduction of rapid testing in 13 PICTs, national laboratories are now able to do their own testing, more reliably and efficiently, and patients receive greatly improved treatment,’ said Mr Toatu. Regional strategy review workshops entitled ‘Making waves: Pacific-led strategy for HIV and other STIs,’ will be held with South Pacific and North Pacific HIV/ STI and Reproductive Health Managers in Nadi and Guam on 18–21 March and 25–28 March respectively. They will discuss the need for a renewed regional strategy to guide the response to HIV and other STIs in the region, together with regional partners and workshop hosts UNAIDS, WHO, UNICEF, UNFPA and SPC. Further consultation will then take place with civil society representatives and other stakeholders. For more information please contact Jacinta Isaacs, Strategic Health Communication Officer, SPC Public Health Division at jacintai@spc.int. 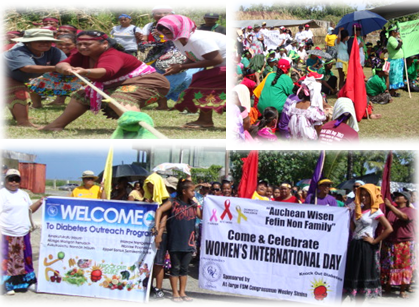 Friday, March 8th, was International Women’s Day and the Chuuk Women’s Council (CWC) joined women around the world in celebrating this special day by honoring ten (10) Courageous Chuukese Women and highlighting their achievements in Chuuk State. The CWC membership selected the women based on their active roles and contributions in their professional, family, community, church, State and National government lives. To begin the day, over 300 women met in a “March-A-Thon” to represent the solidarity of women within our communities. Walking together and singing, this moving symbol of women unity headed to the Anderson Field from the old Stop & Shop parking lot. Fiin Alisi Mama Emiko Souleng christened this special event including the awards ceremony for the recognized 10 women. Sr. Faustina Nedelec is now 75 years old. Celebrated her Golden Jubilee August 21, 2010 where family members, the Catholic Church, government leaders and community leaders jointed the festivities to honor her accomplishments on Fefan. Sr. Faustina has over 50 years’ experience working and helping children, youth, men and with women. She is passionate and committed to promoting education learning and her commitment to advancing women’s involvement in the church and community. Tersita Aten served as Chuuk State First Lady during the period of 1978 and 1986 when her late husband was Governor. During her term as first lady she was very instrumental in the formation of the Chuuk State Red Cross and continues to support the FSM Red Cross today. She graduated from Lorreto Academy High School in Kansas and maintained her position as Executive Secretary for the Department of Public Safety until she retired. She is the founder of the Club 20 that promotes education and focuses on fundraising to secure funds for High School Scholarships. They also recognize Outstanding Students at all the High Schools during Graduation Ceremony every year. Maria William is a true “Woman of Service “as described by her daughter Julia William. Maria William began her career in Education as a teacher’s aide at the St. Cecilia School. After a number of years as a teacher’s aide she moved to Iras Elementary School and began teaching. During her time at Iras, she furthered her personal education at the College of Micronesia, Prell Program, and by attending the summer programs held by Eastern Oregon College in Chuuk. She eventually became the Principal of Iras and held this position for many years, until her promotion to Superintendent for the Northern Namoneas Elementary School. In addition to her educational career, Ms. William is a busy member of the community served at the Immaculate Heart of Mary Parish faithfully, while fulfilling many commitments to her busy life and family of 12. Yurie Gouland was born July 2, 1943 and is the mother of 14 children. She is a former Chuuk State First Lady and was the founder of the Chuuk Women’s Council. She remains a faithful Advisor to the CWC, raised her children and numerous grandchildren religiously, and is actively involved with serving the church that carries her father’s name “Keter Memorial Church”. Mrs. Gouland is an accomplished and dedicated public servant who has done justice to her role as First Lady of Chuuk State. Chineina Graham was born April 7th, 1946. Her collegiate career included the College of Micronesia and the University of Hawaii. Her education focused on elementary education, including summer professional trainings from 1962-1977. Chineina has also worked in a multitude of business functions, including serving as a legal counselor & consultant for the Micronesia Legal Services Corporation, officer and advisor to many local organizations and charities including CWC, Tobacco Coalition, and was founder and Vice President of Ship/Hoops. Chineina has also dedicated her life to being an exemplary mother, having 3 children, one of whom competed as an Olympic wrestler in the 2012 Olympic Games in London. Tanceny Raynold served as the first Chuuk State Government Women Interest. During that time she also served on the FSM Women Advisory Council and as Vice President for CWC. She graduated from Mizpah Christian High School and has always been very committed to public service and continues to promote Christianity and Education in Chuuk. 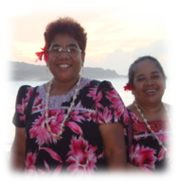 She is also co-founder of the Nukuno Christian High School on Tonowas Island. Carmina L. Billy, born July 14, 1954. Educated in Guam, Carmina served as Assistant Coordinator for the Early Childhood Education Program for the Chuuk State Department of Education. Within the community, she personally organized and currently serves, as the Advisor to the Inamwoto Ramalum Women’s Association. Carmina is the Chairperson for the CWC Board. Dr. Rita Mori, born January 22, 1954. She earned her undergraduate degree from Grand Valley State College in the U.S. and her medical education was pursued in Pohnpei with her post-graduate studies being completed in Fiji. Dr. Rita is the acting obstetrician and gynecologist at Chuuk State Hospital and provides training to local NGOs regarding maternal-child health. Dr. Rita owns and runs a local clinic and pharmacy with her husband. She is a member of the Pacific Basin Medical Association, the Chuuk Medical Association, the Pacific Society of Reproductive Health, President of the Club 20 and Advisor to CWC. Eleanor Setik, RN, N.P., was born January 1, 1957. 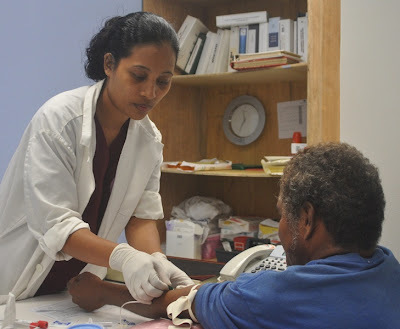 She completed her collegiate study at the College of Micronesia in Nursing, continued her undergraduate degree at UCLA Women’s Health Center where she earned her Nurse Practitioner license. Currently, she is based at Public Health in the Chuuk State and serves as the HIV/AIDS Coordinator. She is actively involved in the Chuuk Women’s Council, and serves as Vice Chairperson and for the Chuuk State Health Services Quality Assurance Committee. Dr. Dorina Fred-Reselap was born July 8, 1967. Doria attended the College of Micronesia’s School of Nursing where she earned her AS in nursing. She worked for Chuuk State Hospital as a nurse until completing the University of Hawaii at Manoa Pacific Basin Medical Officer Training Program in Pohnpei. She finished the program with a MBBS and returned to Chuuk to work in Public Health. Currently, Dr. Reselap serves as the MDRTB physician at Chuuk State Hospital. Her work with MDRTB earned her the CDC’s National Award for Humanitarian Assistance to Patients. She has also served as an officer for the Chuuk Medical Association. CWC used this day to highlight the strength and capacity of Chuukese women with a Track & Field competition that included about 300 women who were divided into seven (7) competitive teams. Each team wore their own colorful headbands which identified them to the delight of their many cheering fans. The various teams signified a specific issue within the community unique to women or an issue the women of Chuuk have been actively involved in during this year. These issues included Domestic Violence (Yellow), Tuberculosis (Maroon), Beautification (Purple), HIV/STI (Red), Diabetes (Blue), Cancer (Pink), and Nutrition (Green). The seven (7) teams competed in a number of track and field events which included the 60 &100-meter dash, the Pinchiri, a walking race, a relay race, and the crowd’s favorite, the Tug-O-War. Prizes were given out to all who participated. When the dust settled and the cheering died down, the Domestic Violence team won the day and took the coveted 1st place award along with the bragging rights that goes with winning - but only until next year! Hopefully, this event will encourage continued vigilance on the part of all the women of Chuuk, and the Chuuk Women’s Council, to stop or significantly reduce the instances of Domestic Violence over the next year and to continue strengthening the voice of women in Chuuk! A Special Kinisou Chapur is extended to FSM Congressman at Large, Wesley Simina, who sponsored this worthwhile event. CWC also expresses their appreciation to the local business that donated and contributed to the success of the event. FSMIS (March 14, 2013): Through a February 22 letter to President Manny Mori, Fr. Rich McAuliff S.J., director of Xavier High School in Chuuk, expressed gratitude to the FSM National Government for its donation of $60,000 through Public Law No. 17-74, signed on February 12, 2013. Fr. McAuliff said, “On behalf of everyone here at Xavier – faculty, staff, administrators, alumni, and especially the students of Xavier, I want to express once again, Xavier’s heartfelt thanks for the very generous donation of the FSM National Government to Xavier High School, on the occasion of our celebrating 60 years of quality education in Micronesia”. In the letter, The Jesuit director of Xavier High also pointed to the fact that four FSM students attending Xavier recently attended the prestigious Junior Statesmen of America Program late February as an indication of the school’s commitment to quality education in Micronesia. “I hope this is a sign of evidence that the $60,000 donation to Xavier is money well spent”, Fr. McAuliff said in linking the donation to a specific learning outcome. The donation was initiated by the FSM Congress which has four Members who trace their high school formation experience back to Mabuchi Hill, the nest for the Jesuit-run institution. The four Xavier students who attended the Junior Statesmen Program last month were Johnny Dhoew, Branden Yamase, Isabel Ambuyoc and K-Andrea Limol. FSMIS (March 14, 2013): Earlier today, a World Bank team that included Mr. Douglas Webb, Senior Telecommunication Legal Specialist and Mr. Jinan Shi, Senior Procurement Specialist made a visit to President Manny Mori at the President’s Conference Room. In general, the World Bank team is to progress preparations of the FSM ICT (Information, Communication Technology) Development Technical Assistance and continue discussions on the Palau-FSM Fiber-connectivity Projects. The FSM Department of Transportation, Communication and Infrastructure (TC&I) is the department with mandates that directly relate to the technical activities of the visiting team. The Department of Foreign Affairs and the Department of Finance and Administration also have jurisdictional roles that correspond with the team’s purposes. A release on the team’s activities and related matters will be provided later. For further information, contact Assistant Secretary of Communication, Mr. Jolden Johnnyboy, Department of Transportation, Communication and Infrastructure at 320-2865. FSMIS (March 14, 2013): The FSM Election Director, Mr. Albert T. Welly, has issued the official declaration naming the winners of the congressional 2-year term election throughout the Federated States of Micronesia. On March 13, the work on results from the states of Pohnpei, Kosrae and Yap were concluded with the certification and declaration of winning candidates. Results from Chuuk were finalized with the mandated certification and declaration issued on March 14. The following tables reflect more details. For further information, write to fsmpio@mail.fm or call the National Election Office 320-7805. FSMIS (March 14, 2013): FSM Election Director Albert T. Welly provided an “Addendum to Declaration of Winning Candidates” with his March 14 letter to President Manny Mori, naming the five victorious candidates from the election districts in Chuuk State. The FSM Information Office received the declaration document at around 1:30pm today. For more information, please call the FSM National Election Office 320-7805 or write fsmpio@mail.fm. According to Anita from the FSM Election Office in Kolonia, over 350 mailed ballots for three election districts in Chuuk were counted earlier today at the office. These mailed ballots were received at the FSM Consulate Office in Honolulu from citizens throughout the U.S. at various locations where polling places were not set up for voting on March 2. These results did not change previous standing in any of the districts, according to Anita. For further information, call FSM Election Office at 320-7805. FSMIS (March 12, 2013): Through phone conversation, Chuuk State Election Office Director, Mr. Yasen Herry, confirmed that the results of March 2 general election have been certified by the Chuuk State Election Commission. For the governor race, none of the candidates garnered over 50% of the total cast votes. Therefore, a run-off election is in order between the top-two vote getters, namely the Narruhn-Williander pair and the incumbent Elimo-Heldard pair. Director Herry stated that according to regulations, run-off election must take place on the fourth Tuesday after the general election. For that reason, the election office is preparing for the run-off to take place on the 2nd of April, 2013. As for petitions or any form of intervention to challenge the results, Mr. Herry said that there has not been any by any of the gubernatorial candidates (as of the time of the interview). markapito@gmail.com for inquiries or call Chuuk State Election Office via 691-330-2231. According to a staff of the FSM National Election Office, the mailed ballots for Chuuk Election District No. 2 (Northern Namoneas) will be counted at the main office today (March 12) at the 11:00 A.M., Pohnpei time. Poll watchers for the candidates -- Victor Gouland and Roger Mori, have been notified. They will be present. The staff also mentioned that the election director intends to certify all results later on this afternoon. The following results were provided by the Counting and Tabulating Committee chairman through email on March 11. He indicated that the final results had been submitted to the Chuuk State Election Office for certification on March 10. Winner(s) per precinct are in bold and italics.